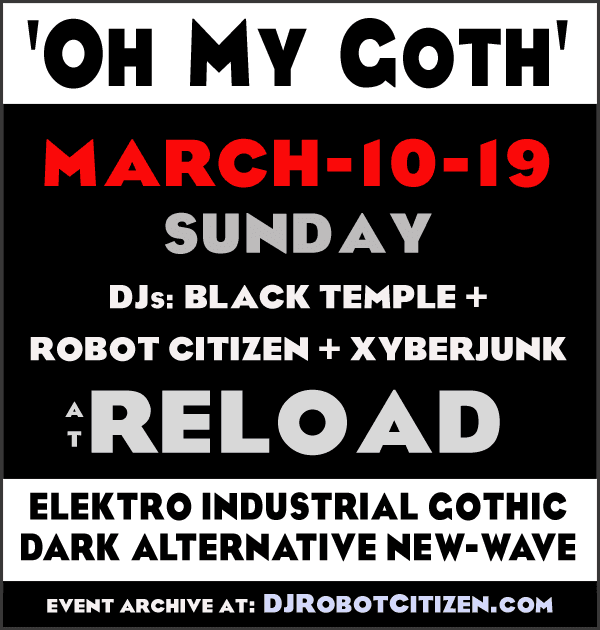 After a long gap of almost 6 months "OH MY GOTH" is back for event number 4. 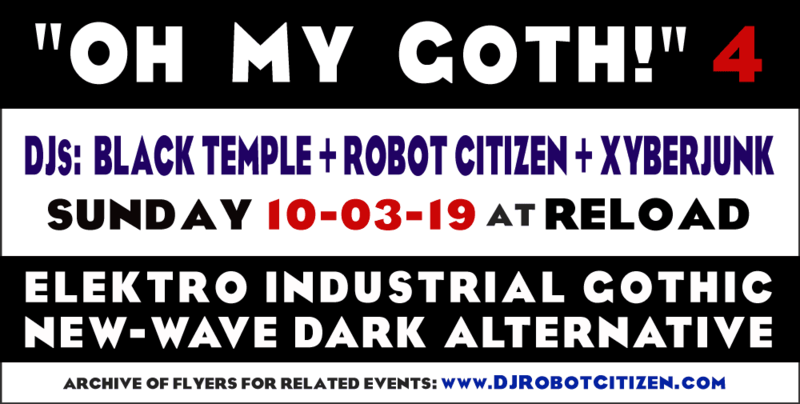 This event features music in the styles of dark alternative electro industrial electronic dance punk gothic rock music. * Black Temple the coordinator of OMG and frequent DJ at Reload. * XyberJunk formerly known as 'WolfAngst'. * Robot Citizen of Vamp nightclub 2007-2017 and many others before and during then. + AustralianGothicIndustrialMusic.com - a big site with profiles and.or links for hundreds of bands, groups, musicians - thousands of songs - from Australia and New Zealand. A summary 200+ song playlist is on Youtube via this link for Australian Industrial Gothic Music Scene. + List of Australian Gothic Scene nightclubs. + Archive of hundreds of Canberra Goth Clubs - flyers, posters, dates, DJs, bands. + Sydney Gothic club "The Winter Ball" 2016 . . . Vamp at Transit Bar 2016 . . . Oh My Goth #1 at Reload 2018 . . . Sydney Gothic scene event "The Ravens Ball" January 2017 . . . Canberra gothic club "Vamp" February 2017 at Lobrow . . . Sydney Goth Club "Asylum" in 2015 . . . Canberra Burlesque Scene event "Faraway Fever" April 2018 fundraiser for Jazida at The Abbey . . . Canberra Alternative Music Club "Vamp" in April 2017 . . .
- S.I.N.G.E.D. 2 - follow-up 2015 compilation. - the ElectriCity 4-volume collection of electronic music artists from Canberra. It's free to download via the Blatant Propaganda bandcamp channel here: Canberra electronic music compilation albums. - Songs of Protest: political protest songs by a variety of underground Australian bands.